Turns out a Southwestern Tex-Mex salad by any other name would not taste as good. Vivid menu descriptions — “applewood-smoked bacon,” “Maytag blue cheese” and “buttery plump pasta,” for instance — can increase restaurant sales up to 27 percent, according to research by Brian Wansink. Furthermore, diners feel more satisfied after eating a Southwestern Tex-Mex Salad than after eating the same salad with a blander name. So why do these adjectives sell while others just get in the way? Vivid. “Freshly cracked,” “light-and-fluffy,” “handcrafted,” “triple-basted” and “slow-cooked” paint pictures in the readers’ minds. Those pictures are more compelling than, say, a plain, old omelet. Sensory. I, for one, want my bacon applewood smoked. Descriptions like this engage the readers’ senses. Emotional or nostalgic. “’Aged Vermont cheddar,'” he writes, “evokes images of crusty New England dairymen rather than Kraft mega-plants.” “Boodie’s Chicken Liver Masala” and “Grandma’s zucchini cookies” also evoke emotion and nostalgia. Specific. “Wild Alaskan” salmon conjures up “visions of vigorous, healthy fish swimming in pristine, unpolluted streams,” he writes. A diner can dream, can’t she. Branded. I strongly prefer Maytag, Stilton and Roquefort to plain old blue cheese … even though I’m not that clear on the difference. Bottom line: Sprinkle in a few adjectives when they’ll change the picture in the reader’s head or otherwise engage the senses. But don’t use modifiers — gorgeous, great, groundbreaking — that just take up space. Want more tips and techniques for measurably improving readability? 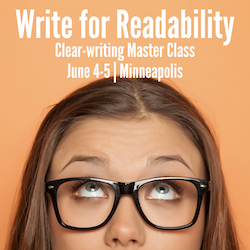 If so, please join me at Write for Readability — our two-day clear-writing workshop on June 4-5 in Minneapolis. There, you’ll use a cool (free!) tool to get 27 text statistics on your piece — from the Fog Index to the Flesch Kincaid Grade Level. 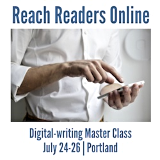 Watch your readability skyrocket in our practice sessions. Students have increased reading ease by 1,200%.